Triangle Inc. – an advertising agency founded in 2009, by three Birzeit University students, who aim to put their talents in use, gain experience that would help them expand their potential in the field of design and advertising, as well as to achieve a professional level of advertising that would compete in the world market.  Triangle Inc. is specialized in advertising, as well as web and multimedia production. Triangle Inc. has completed several projects with International clients in addition to many clients in the Palestinian market. We, at Triangle Inc., are proud to say that its reputation is growing day by day, and its staff members are dedicated to provide its clients with the best results. To be leaders in the field of advertising and to bring out new ideas that will change the concept of advertising in the market. A print piece or a successful website is not only a pretty design; it is a full understanding of what the client wants and needs. This is why we, at Triangle Inc., discuss and understand our client’s requests and desires, and work together to deliver appropriate, satisfying, and the BEST idea, design and print. Let our “Brilliant Minds” do the job.